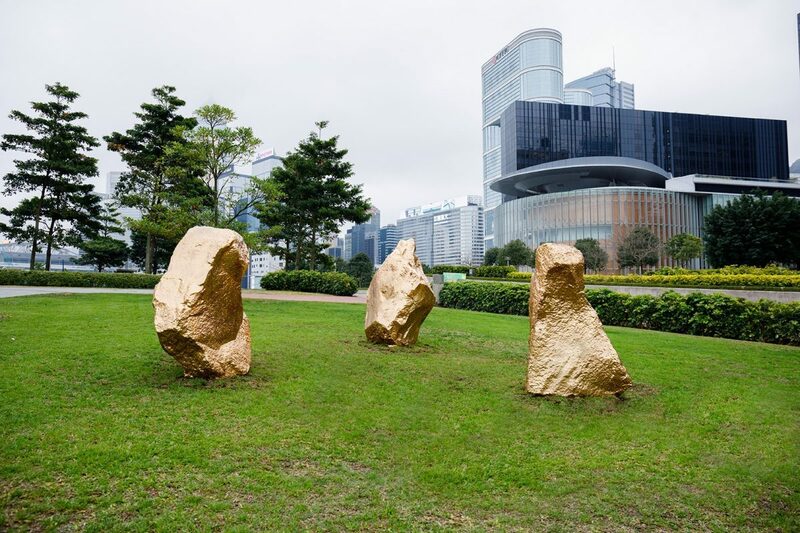 Bosco Sodi’s volcanic sculptures are on view at Harbour Arts, Hong Kong’s first international sculpture park. Bringing museum-quality works to the public, the sculpture park has dramatically transformed the landscape of Central and Wan Chai Harbourfront. Sodi’s rock sculptures are created by extracting dried volcanic magma from the Ceboruco volcano in Mexico; by encasing them in a gold ceramic glaze the artist brings together some of Earth’s most recent geological formations with ancient and precious metal. Curated by Fumio Nanjo, Director of Mori Art Museum and Director of International Programme at Hong Kong Art School, and Tim Marlow, Artistic Director at the Royal Academy of Arts, the park features work by emerging and renowned local and international contemporary artists and offers a unique opportunity to experience world-class art set against the backdrop of Hong Kong’s iconic skyline. Other participating artists include; Michael Craig-Martin, Tracey Emin, Jenny Holzer, Antony Gormley, Yayoi Kusama, Tony Oursler, Conrad Shawcross, Mark Wallinger, Zhan Wang, Wong Chi-yung and Morgan Wong.